Howard Marks: The Most Dangerous Thing The Fed Ever Did Was Convince Investors That "It's Different This Time"
As the infamous quote from the movie "the Usual Suspects" goes: "The greatest trick the devil ever pulled was convincing the world he didn't exist." Similarly, as the billionaire investor and Oaktree Capital Management founder Howard Marks explained during a recent interview with RealVision's Grant Williams, the most dangerous trick the Federal Reserve ever pulled was to convince investors that "it's different this time". That in the post-crisis era, the central bank has discovered an elixir to eliminate the business cycle, installing in its place an everlasting bull market, abetted by a "goldilocks" economy, where every dip presents an immediate buying opportunity. Williams described Marks in their interview as "a great student of [market] cycles" before questioning whether old-school thinking about the boom-bust nature of the markets was even still relevant in the post-crisis brave new world that QE and negative interest rates have brought us. But Marks quickly dismissed this, affirming that he is still believes in the value of analyzing and timing the market cycle. 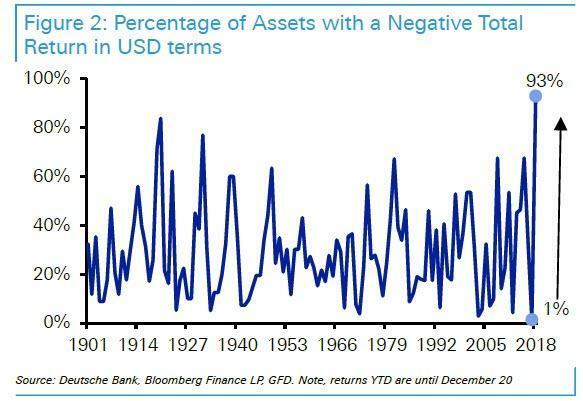 Perhaps that's why his fund, Oaktree Management, seized the opportunity to deploy capital during Q4, when nothing was working (2018 will go down in history as one of the worst years for financial markets on record, given the breadth of losses across asset classes), and everybody seemed to be selling in a panic. Elaborating further Marks explained his view on where we are in the cycle. Until Trump's arrival in the West Wing, the recovery had been chugging along slowly (while asset prices had been moving in a nearly uninterrupted diagonal line from left to right). Setting aside the direct impact of central bank liquidity, Marks explained that after the crisis, people and businesses were left traumatized, which was one reason why growth was so tepid, even once this immense monetary assistance had been factored in. But the fiscal stimulus unleashed by the Trump administration, in the form of tax cuts and increased federal spending, was like administering a "shot of adrenaline to an already healthy patient." For this reason, Marks doesn't think the highs are in - at least not yet. But ultimately, he believes we will get to new "highs that lead to lows." GRANT WILLIAMS: There must come a point where things get out of hand. Going back to the original question of 2005, 2006, do you see any similarities in what you're seeing and what's starting to make your spidey sense tingle? HOWARD MARKS: Not similarities in the sense of specific things repeating. But I have felt that because people were traumatized by the great recession, the recovery has been the slowest one since World War II. And that has kept things moderate, which meant that we would certainly have a recession one of these days. But it would be moderate. When you don't have a boom, you don't have to have a bust in my belief. But now between the tax bill, which was a shot of adrenaline into, in my opinion, an already healthy patient, and then the possibility that we're going to see a Powell put in action, I think that we may get to highs that lead to lows. I'm a believer in cycles. I believe they always have occurred, I think I understand why. And I think they always will occur and I try to study them. And then when I kind of got to the end of writing the book I said, well why do we have cycles? If the market goes up 10% a year on average, why doesn't just go 10% every year? And in fact, it almost never goes up between 8 and 12. So the average is not the norm. Why not? And the answer, I think, is excesses and corrections. So you have a trend line and most trend lines are upward sloping, but then you deviate from the trend line on the upside because of some combination of optimism and greed and wishful thinking. And then you have to have a correction to the downside. So now I'm thinking we may have more of an excess, which leads to more of a correction. And the longer the Fed and the federal government forestall a recession by artificial means, the worse the fallout will be when one finally arrives. Offering an extremely apt analogy, Marks contrasted the Fed's machinations with the "good forest management" policies needed to prevent out-of-control wildfires like those that have erupted in California over the past two years (see here for an example of what we're talking about). Marks reasoning goes, the best way to avoid an out-of-control blaze is to permit moderate fires to burn from time to time. That way, they clear out the underbrush. But if we extinguish every blaze before it has a chance to burn, then we put ourselves at risk for a "big one" that could quickly accelerate beyond our control. GRANT WILLIAMS: When did we get to the point where a recession is something that has to be avoided at all costs? HOWARD MARKS: Yeah, well it's a big mistake. In one of my memos - postmortem for the global financial crisis - I talked about forest fires. Good forest management, you permit there to be fires once in a while. And if there are fires of moderate size, occasionally it burns out the fuel and then you don't get the one big one. Same thing, in my opinion. And the fluctuations of the economy are natural, in my opinion. And should be permitted to occur. And if you try to forestall them, then when they happen - I don't think you can forestall forever. And when they happen, they're bigger. Over the past 20 years, the whims of the financial markets have grown to outweigh the influence of the economic cycle. The financial crisis, for example, had almost nothing to do with the real economy, Marks explained. Which is why tacit Fed policies like the "Powell Put" could be far more destabilizing than many investors might suspect. GRANT WILLIAMS: Yeah sure. Well you mentioned cycles, I know you're a great student of cycles. And they used to be so important in markets - everywhere you look. Whether it was the human cycle, whether it was a market cycle, credit cycles - everything seemed to have a rhythm. And it made investing a lot easier because you could at least have some sense of how these cycles would turn. That seems to have changed significantly in the last 15, 20 years. You're shaking your head there. HOWARD MARKS: I don't agree with that. If you talk about 20 years, if you came in this business 20 years ago, you have seen two profound cycles. You had the TMT bubble and crash and then you had the mortgage bubble and crash. And I think that maybe they weren't predictable, but I'm not sure they ever were. GRANT WILLIAMS: I wouldn't classify those cycles. I kind of look at them and think they were both attempts at cycle turns that happened quickly in kind of short order in small corners of the market. And then got squashed quickly by Fed policy. HOWARD MARKS: Well, they were market cycles - bubble and crash. HOWARD MARKS: They weren't economic cycles in the traditional sense. And in the last 20 years, I think that developments in the financial world have taken over in importance from developments in the rest of the business world. Ultimately, Marks still believes in the importance of understanding market cycles because, fundamentally, human nature hasn't changed. Which is why it's dangerous to believe that, in an increasingly unstable world, that stability has become the norm. HOWARD MARKS: ...And the big theme of the book is Mark Twain - history does not repeat, but it does rhyme. And the world is just too unstable a place to believe that stability is the norm. And you know if you think about it, in the economy a great year is up four, and a bad year is down two. So the economy has an upward trend and it kind of goes like this. Then companies have leverage - financial leverage and operating leverage. So their profits go like this. And then the market goes like this. And why? Because of people. The risk in the market does not come from stock certificates, companies, exchanges, it comes from people. But people are prone to excess and I don't see how it can be argued otherwise. And by the way, when people say, I don't think we're going to have cycles in the future because the astute Fed has it under control - or whatever it is - what they're saying is what I consider the four worst words in the world - it's different this time. OK until now we've had cycles, but we're not going to have anymore. One risk that markets are probably failing to truly understand is the rise of the radical left, and their support for "confiscatory" taxation policies. GRANT WILLIAMS: I mean, it certainly seems that way. When you look at the traction Ocasio- Cortez is getting - and Liz Warren - and it's clear that they both realize that this is how we're going to create that traction - by going against the elite. But some of the things they're proposing are the 70% tax. Liz Warren was on MSNBC looking straight down the camera at everybody else saying, we're going to find your wealth and we're going to come and get it. These are things that I'm sure a lot of people in America never thought they'd hear in this country. 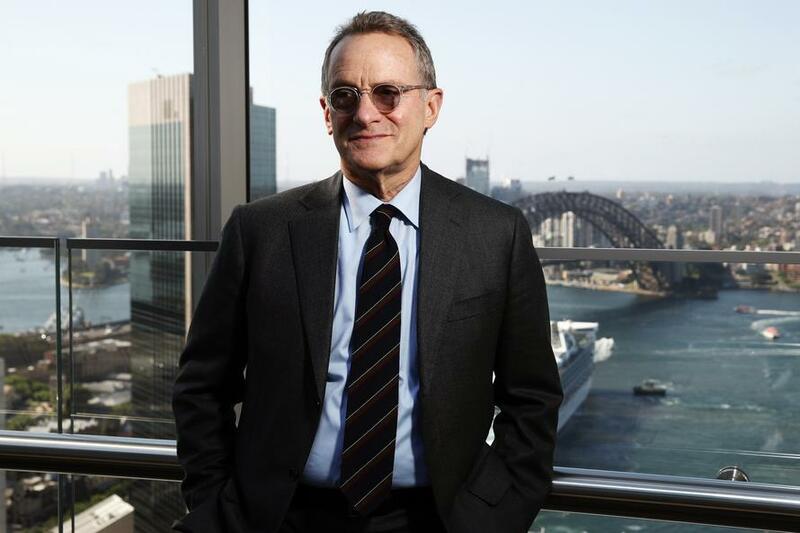 HOWARD MARKS: I think the thing in the memo that I got heated about the most, and I was trying to put it out and then Friday Elizabeth Warren came out with her wealth tax idea. But what got me was that - she tweeted it out of course - the way she did it. She said something like - don't quote me - the rich and powerful run America and look at what they have arranged for themselves. They are allowed to keep their accumulated wealth. Well, guess what? We're all allowed to keep our accumulated wealth. And she makes it sound like - through some skullduggery - they have exempted themselves from the wealth tax. You can't exempt yourself from something that doesn't exist. But she makes it sound nefarious. And that's populism - they, they. And it's not constructive. I would lay a strong bet that five years from now, my tax rate will be higher than it is today. But it should be, as I said in the memo, it should be progressive, but not punitive. And not confiscatory. Among other things, people don't have to sit still and pay it. I wrote a memo back in 2016 called "Economic Reality" and I talked about a guy I know who was the biggest taxpayer in New Jersey. They raised the rates to a point where he moved to Florida where there is no tax. So the point is, the people who want to confiscate seemed to think that there's nothing that the confiscatees can do about it. Marks believes the growing divisiveness in Washington will lead to increasingly counterproductive policymaking, as Democrats and Republicans focus more on spiting one another by passing major policy initiatives without any participation from the minority party (Obamacare and Trump's tax bill are both examples of this). But shifting his focus back to his investing strategy, Marks explained that he recently realized that cyclical extremes offer probably the best chances of trades with high returns. "When you are at an extreme high or an extreme low, the logic is compelling and the probability of being right is high." But the problem is, these opportunities don't come around very often. Marks most successful market calls occurred about once a decade - 5 times in 50 years. But another inflection point where valuations are obviously overstretched could be just around the corner.